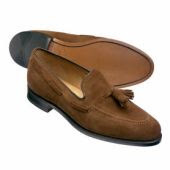 Brown Suede Shaftsbury Tassle Loafer Shoes shouldn’t miss from a gentleman’s wardrobe. This pair of shoes adds a little extra to any outfit. This durable pair of shoes is made of 100% suede leather and the sole is made of a combination of leather and rubber. They’re perfect for unofficial meetings with members of high class.